Roth's impossibly long lashes lowered as what Cayman had said sank into the minds and imaginations of all those present. One by one, they looked at me like...like I'd murdered a nursery of babies and then bathed gleefully in their blood. Love is a strange creature one thinks one has a grasp on and understanding of, only to discover later that it was only the barest taste of the real thing. And there were so many different kinds of love that much I knew and I didn't know where Roth fell in all of that. He'd already moved forward, heading for the area near the hoopless basketball pole. All the occult and satanic stuff had long since been removed, but there was an evilness that still lingered in the cold, dank gymnasium. The place gave me the creeps. There is nothing that can be said in this review, that I am sure thousands of other reviewers have already said. JLA is quite simply a literary genius and I eagerly devour ever novel of hers that I pick up. 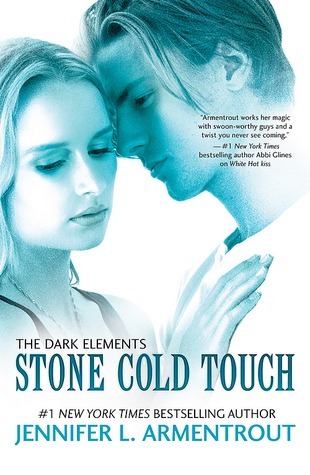 Admittedly it took me a little longer than expected to pick up Stone Cold Touch, but like always it was well worth it when I did. There is a pull like no other once you open the first page, and a feeling of excitement at revisiting whatever awesome world has been created. You can always count on Armentrout to pull you right back in. It doesn't matter how long it has been since you read the last book, because slipping into the next one happens as easily as breathing. This may be because she picks up around where she left off, or maybe it is because you know that you are diving into a book that promises to blow you away. Either way there is no denying that between the characters, the pacing and the plot you will not want to put down this book for even the slightest moment. JLA is also one of the few authors that have the ability to create a love triangle that does not make me want to scream. She can weave a guy or two into a book without you even thinking twice. That and there are so many strong characters backing up the main ones. The struggle is real when it comes to Layla. I have liked her from the start for her strength, her resistance, and her realistic struggles. No I am not talking about her having two super hot guys in her life, that she has to struggle to figure out what one to pick. Layla has a lot against her being half of two warring worlds. It's hard to fit in when you seem too good for one but one the other hand you are always watch because you "can" go bad at any moment. However, Layla handles all of the crap that is flung at her quite well. I can't say if I would stand up more if I were in her position or not. This being said Layla is an amazing character that you wont be able to resist loving and laughing with. I wont say boys are Layla's biggest struggle (soul sucking is a serious problem), but boys sure seem to stir up enough crap for her. This for many will be a team type of book; for me I'm not sure if it is or not. I was never really for one boy or another to start *cough* Roth *cough*. Both guys have their ups and downs and their own part in this story. Roth is your bad boy 110% and Zane is the boy scout. Then things get all complicated because even the best of boys can be bad, and even the bad boys can have a little light in them. If you are looking for a review that tells you what team to be on, this is not the review you are looking for. I'm probably more confused than you are. Stone Cold Touch is a little bit of everything for everyone. You have fantasy, romance, action and the inability to put the book down. The last being the most important. There is so many little details that I could carry on about, but all you really need to know in the end is that JLA wrote the book and you will without a doubt love it (after you read White Hot Kiss that is). If you don't have these books on your shelves or on your kindle get them there as quickly as you can.